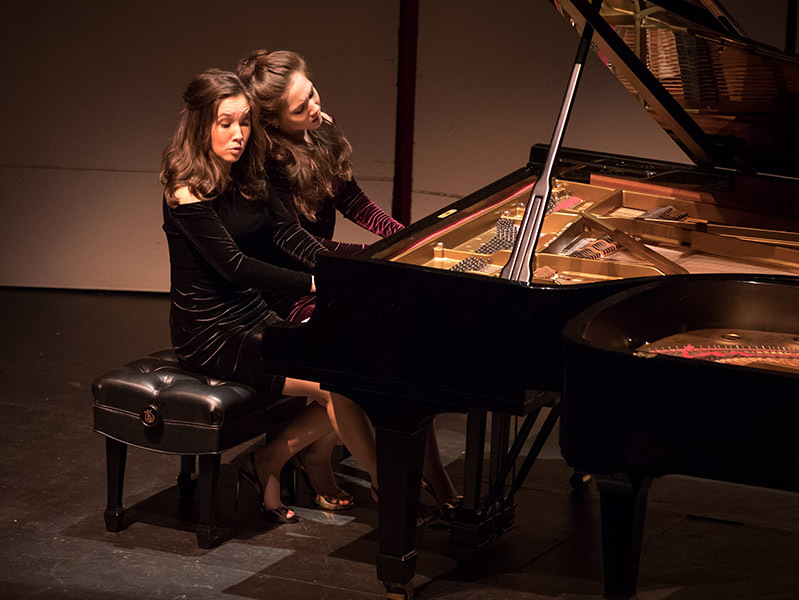 This past weekend we had the pleasure of seeing twin sister pianists Christina and Michelle Naughton perform a mix of piano music for four hands and two pianos from the classical to the modern eras. As was the case with Yekwon Sunwoo, these two concerts provided a much appreciated break from the woes of the world, giving us a chance to take some time to refresh and renew through the magic of live music. We heard glorious sounds and witnessed the physical connection each of the women had to the piano, the music, and each other. The movement of their bodies and hands, which at time seemed choreographed, never detracted from the performance but did provide another insight into their relationship with the music. On both days I watched the crowd as they filtered in and there was a palpable excitement in the air; people seemed to know something significant was going to happen. As we settled down, turned off our cellphones (well, most of us did), the Naughton sisters emerged and sat down next to each other to play the Andante and Variations in Bb Major for Four Hands by Mendelssohn. 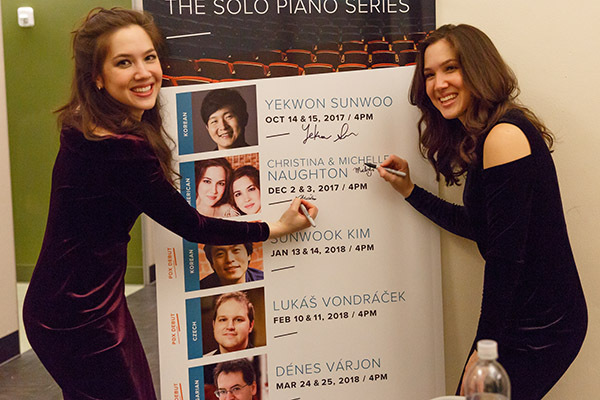 This virtuosic piece was a great vehicle for the sisters to showcase the brilliance of the piano, with moments of declamation, groups of notes so light and articulated they were like filigree, and astonishing synchronized releases. The crowd loved it and cheered when they were through. The next piece was the Sonata in D Major for Four Hands by Mozart. The three movements - a fast-slow-fast combination - gave them a chance to show us how much fun it is to play Mozart’s four hand music. You could see on their faces how much fun they were having, and their body language followed suit. In the first movement they would move closer to the keyboard when the music was pianissimo and their bodies opened up for the forte sections. The second movement took us to a different sound world - instead of lightning fast passages and ornamentation, the sisters took a perfect andante (walking) tempo and graced us with gentle bell sounds in the treble; at times the music sounded almost improvised. The final movement was full of grand, sharp energy and from time to time the pianists appeared to look around to see if the audience was having as good time as they were. The look of delight on their faces was endearing, and overall this piece was a crowd-pleaser. The longest piece on Saturday’s program was Ravel’s Ma Mére l’Oye for Four Hands. Four of the Mother Goose stories were set to music - Sleeping Beauty, Little Thumb, Laideronette, and Beauty and the Beast; Sleeping Beauty story is revisited in the final movement. These are programmatic pieces set to slow to moderate tempos, and are incredibly expressive. The sisters did a wonderful job of taking this luxurious, atmospheric, Impressionist music and moving us to a better place with it - one where it feels like everything in this tumultuous world we live in will be OK. On a personal note, this was my favorite music of the weekend. The final piece on the first half couldn’t have been more different - this would be the Sonatina for Four Hands by Conlon Nancarrow. Its modern gestures and harmonic language was a stark contrast to the Ravel. It was jagged, more brash, more dissonant - and even had some jazz sensibilities. The sisters launched themselves into a different style of showmanship in their playing and it sure looked like they were having a ball throughout. Their mad skills on the instrument were in our face - the audience absolutely loved it! After intermission, we were treated to the Rondo in C Major for Two Pianos by Chopin. Because the sisters were separated into two instruments it was particularly enjoyable to sit back and close my eyes and take in the fact that there were two pianos playing that truly sounded like one. I have to give props to the excellent tuning job between the pianos, which no doubt helped ensure that experience. The piece was delightful, powerful, and passionate, with a range of dynamics - on that front, it was impressive to see how the sisters were perfectly in sync not only with their starts and releases but with the louds, softs, and everything in between. Finally, the recital ended with the Nutcracker Suite by Tchaikovsky (arranged by N. Economou). 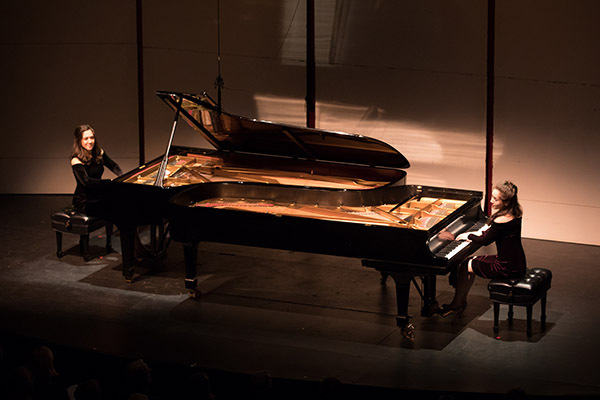 Eight numbers were set for two pianos, and it was simply a delight to hear them during this holiday season. Everyone - pianists and audience - were having a wonderful time and you could feel the happiness in the crowd. It comes as no surprise that they got a standing ovation and cheers from the crowd. The encore gave us a chance to calm down after the excitement of the Nutcracker Suite - it was the achingly beautiful Sonatina that opens the Cantata Gottes Zeit ist die allerbeste Zeit, BWV 106 (AKA Actus tragicus) by JS Bach, transcribed for four hands by Kurtág. The beauty in its simplicity caught me off guard and I felt deeply moved by it. This was a very satisfying way to end a wonderful musical afternoon. Sunday’s program was completely different from Saturday’s and started with the Variations in G Major for Four Hands by Mozart. A light rococo-style opening gave us a sprightly treble and rich bass, and often went into a kind of rhetorical chattiness. The sisters seemed to be having a good time playing something lighthearted. I was especially impressed by their deft and technically solid finger mechanics during the sections where extended runs of bass notes were played - it was very smooth and blended into the background; tuning into it felt as if you had found an aural easter egg. It was a great opener to the recital. Next came Lebensstürme for Four Hands by Schubert, a piece that was published posthumously. The sisters coaxed out deeper emotions from this piece compared to the Mozart, and at time the music seemed to resonate out of their bodies. They obviously love this music and the tactile connection they had with the instrument. The final piece of the first half was Hallelujah Junction for Two Pianos by John Adams, a minimalist piece that reminded me at times of the work of Steve Reich. One unexpected thing that happened was that someone’s cell phone timer went off in the middle of the piece and ironically it matched the rhythms happening on stage quite nicely; no doubt John Cage would have approved. There were a lot of beautiful sounds and gestures in this piece and the sisters seemed to both enjoy themselves and each other. The hocket section toward the end was particularly playful and it was a lot of fun to see them play off each other. I was also impressed by their loose, flexible wrist movement that made their hands look like dancers. After intermission we dove into En BLanc et Noir for Two Pianos by Debussy. While sharing the categorization with Ravel of “Impressionist,” this piece had a much more modern sound. It was a virtuosic piece employing a range of articulation, moods, and exploiting various colors of the instrument. The audience loved it and showed their appreciation with extended applause. The final piece of the afternoon was Five Days from the Life of a Manic Depressive for Four Hands by Paul Schoenfeld. The sisters expressed through music what no doubt many of us have experienced in our own lives - being plagued by distracting thoughts, attempting to relax but the mind won’t shut off, hard emotions weighing on one’s heart and mind, and finding the light that breaks through the erstwhile stormclouds of life. The music was often manic, and some of the chordal passages sounded like an intended slog, but there were times of grace, too. The look of confidence and total immersion on the sisters’ faces as they played was inspiring - it was the bedrock we needed to cling to as we maneuvered with them through the cacophony and frenetic activity in the piece. After they finished there was a touch of laughter, and most audience members jumped to their feet, filling the hall with thunderous applause. Despite the challenges in the music, it certainly made a connection with those who witnessed the performance. The encore was the Danse Russe from The Nutcracker Suite from the night before. It was the whipped cream on the top of an incredible afternoon of varied music from Christina and Michelle Naughton. Meg Cotner lives and works in Portland, Oregon. 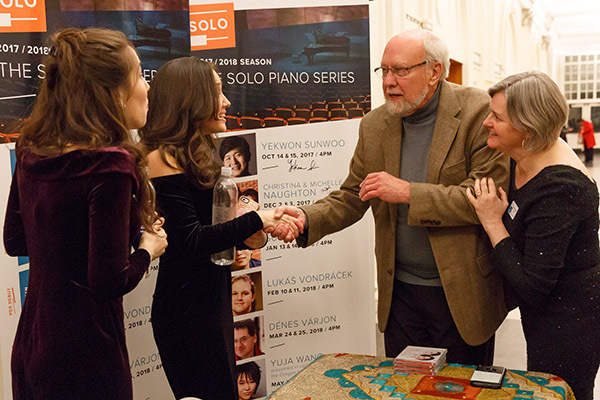 She has a background in classical music, starting with piano lessons in her late teens and eventually earning a DMA in Harpsichord from Stony Brook University (NY). During her time as a working musician she fell in love with writing, and ultimately exchanged one keyboard for another. She is a published author, and currently writes and edits digital and print works related to the arts, food, and culture.